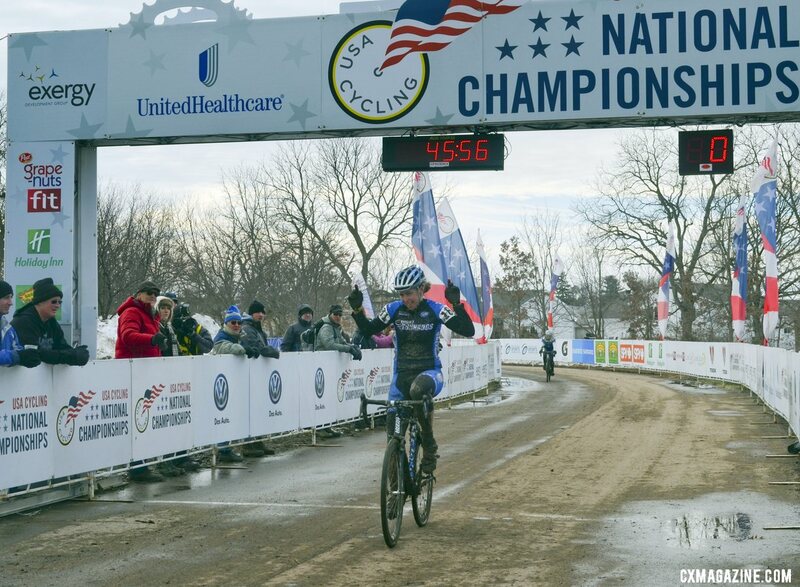 VERONA, WISCONSIN—While no one was surprised that Katie Antonneau took the collegiate D1 title, racing for Marion University in Division 1, what did surprise crowds was how close to her the D2 women’s racer Erica Zaveta of Brevard College was by the end of the race. 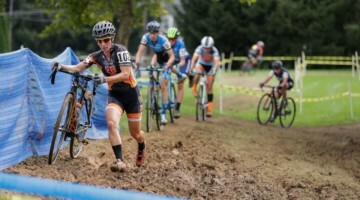 Despite starting a minute behind the D1 racers, Zaveta plowed through the field ensuring her win and showing the crowd that she’s got mud handling down to a science. 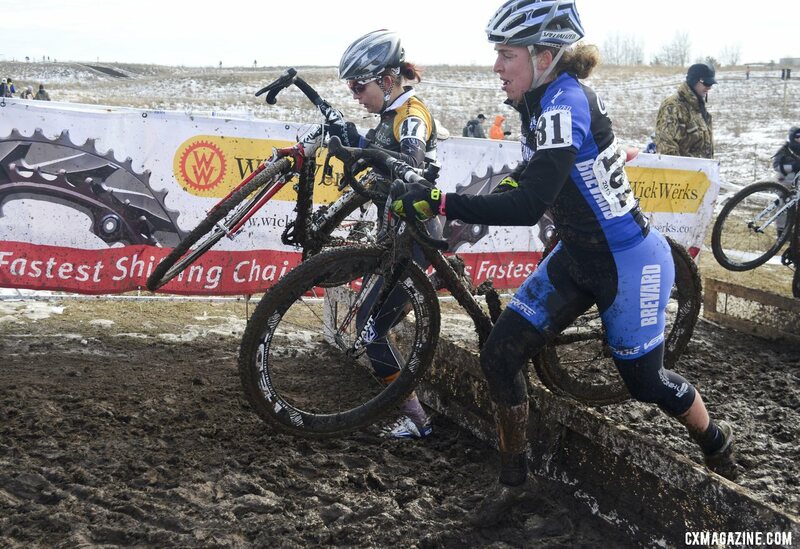 As temperatures steadily drop in Wisconsin, a sign of what’s in store for tomorrow, the mud is slowly getting thicker and thicker, making lap times significantly longer as the day has worn on. Earlier this morning, laps were sup-10 minutes, but in the collegiate race, even Antonneau was posting 15 minute laps. Antonneau took the holeshot, and was untouchable from the start. 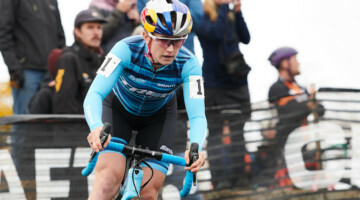 Brittany Clawson of Fort Lewis gave chase and was able to stay close to Antonneau through the first set of barriers, but it was readily apparent that the race was Antonneau’s to lose. Behind the two, a group consisting of Kimberly Flynn (UNC), Sofie Gomez-Villafane (Fort Lewis), Kaylan Comer (Virginia Polytechnic), and Sarah Sturm (Fort Lewis) chased. 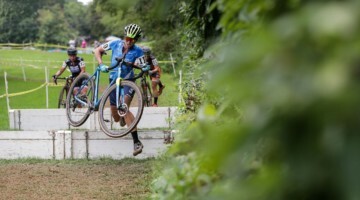 By the second lap, Antonneau and Clawson retained first and second, and Flynn had moved into third spot well ahead of the rest of the group. Behind them, D1 and D2 racers became intermixed and spread out across the entire course. 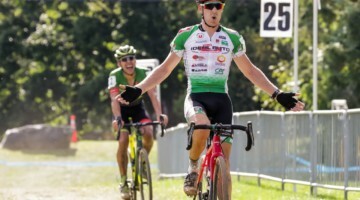 With one to go, Flynn had moved into second spot, and Sturnm and Gomez Villafane were chasing for third. While Zaveta’s early lead was nearly unstoppable, early action between second and third – MIT’s Christina Birch and University of Denver’s Rebecca Gross – was heating up. Gross had the initial gap on Birch, but halfway through, Birch caught the U Denver rider and began to dig in, slowly creating a gap and passing all but a couple of the Division 1 racers. The top three racers were literally minutes ahead of the rest of their strung out field, and in both D1 and D2, a lot of the women were pulled before having to do a third lap. The gaps remained for the entire race, and while Zaveta took the win, a beaming Birch took second and Gross sailed in for third. Don’t forget to enter to win a trip to Worlds courtesy of Raleigh! 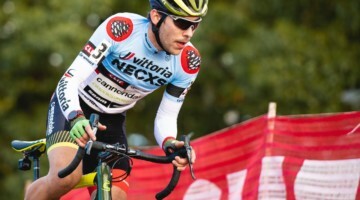 Tune in regularly right here to Cyclocross Magazine’s 2013 National Championship Homepage for the most comprehensive source of Nationals 2013 info. We will be updating this page hourly for race reports, results, photos and videos!